I’m going to start at the end today, since it’s more exciting 🙂 I rode Natty for the first time today! She was wonderful, as good as I could possibly have expected her to be. I would almost think she’d been ridden every day of her life. I wanted to keep the first lesson short and sweet and end on a good note, so we just went twice around the arena at a walk and then I got off, but she was totally calm about it. She acted the same as she does when she’s just loose in the arena – walking around, looking outside, sniffing things from time to time. I did a tiny bit of steering, and she turned just fine (sorta like neck reining since I was just riding with her halter and two lead ropes), and she stopped for me to get off, too. I rode the first lap without stirrups in case she decided to toss me off and then picked them up for the second lap, and she was fine with the flopping stirrups and my moving my feet around to pick them up. After I got off and took the saddle off, I gave her big hugs and whole handful of berry treats to reinforce that she behaved exactly the way I want her to. Then I turned them out in their paddock with a bucketful of alfalfa cubes and more hugs! Here she is all saddled up with her new draft horse girth and the stirrups on! Ok, NOW I’ll start at the beginning. Natty and Chance had a hoof trim appointment this morning. I stopped at the post office on my way to the barn to pick up the package with Natty’s girth in it (size 64, ordered from the draft horse supplier). I got to the horses just in time to groom them a little, and then since it’s a new barn, I walked them down to the end of the driveway to flag down the vet and farrier. There’s an apple tree at the street and grass all along the driveway, so I figured they would be happy enough. Well, when the vet arrived, Chance decided he was afraid of her truck, so he acted like an idiot and I had to lead both back to the barn so she could pull into the drive. Figures. I seriously doubt Chance is afraid, but I’m still going to work on this! Anyway, we got back to the barn, and the farrier managed to find the place without the horses for landmarks, so all was well. Last time, Natty’s dose of sedatives seemed good, but it wore off just a little too soon. That time we had sedated her right before starting Chance’s trim. This time we gave her the same dose, but we did 3 of Chance’s feet first so we’d have more time before Natty woke up. Chance was really good this time! I was so proud of him. Not that he’s ever bad, but he was really good this time. Everybody just loves him. Natty was pretty out by the time her turn rolled around. The goal with her is to get her sleepy enough that she won’t struggle but can still stand up by herself – and let me tell you that’s a fine line! She was leaning and standing with legs very splayed but still trying to pull her feet away at first. By the end she was doing better. She was a little better than last time, I’d say. The vet says she looks perfect and doesn’t want her to lose any more weight, and she said she wants them to have at least 1 flake of alfalfa per day, so I’ll be adding that to their diet. Chance got his baby shots today too, and he’ll get his boosters in a month. I put Natty and Chance both back behind the arena on some good grass after their trims and poked around cleaning their stall, giving them fresh bedding, scrubbing their buckets, etc. – I actually enjoy barn chores, so this was great for me. 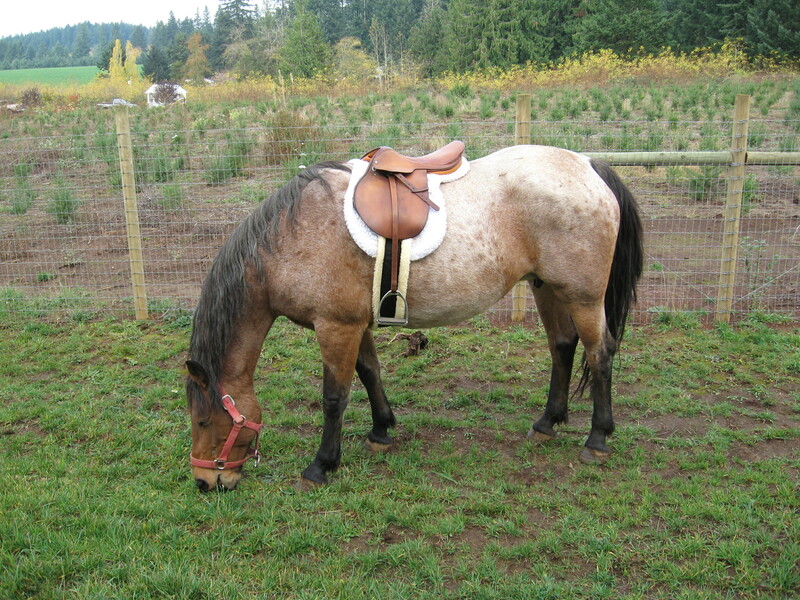 Since Natty will tolerate anything when there’s grass, I hauled the saddle and girth out there to try it on her. She did really well as I tightened the girth one hole at a time over a period of several minutes. Then, she just kept grazing, so I went and got out the stirrups and put those on. She didn’t mind them either, so I decided to try to ride her for the first time. I took them both back into the arena and put the two lead ropes on Natty’s halter. I stepped up in the stirrup and laid across the saddle a couple of times, and she was fine with it. I then actually mounted, and she started to walk right away but not with any fear or anger. That time the girth was pretty loose and the saddle slipped when I mounted, so I just rode the length of the arena, hopped off, and fixed the saddle. She isn’t bothered by dismounting, either. The second time, I got on her and we did our two laps, complete with a turn and a stop. Sounds silly, but it was a very exciting day for me and a real milestone! I’m so proud of my big girl for doing such a good job! This entry was posted on November 7, 2008 at 11:14 pm and is filed under Uncategorized. You can follow any responses to this entry through the RSS 2.0 feed. You can leave a response, or trackback from your own site.